We explore the new litigation finance industry and how it’s evolved. A recently emergent industry that has developed rapidly since 2010, “litigation finance” is a relatively new industry that combines the practice and analysis of law with the tools and structure of investment management. Historically, the first litigation finance funds were focused on consumer level litigation (e.g., personal injury), in which funds would finance individuals that lacked capital to pursue consumer litigation through a strong legal team. By providing financing to enable an individual to pursue a lawsuit, the litigation finance firm would participate in a substantial percentage of the outcome of the lawsuit. While the consumer segment of the industry has steadily grown since inception, the enterprise segment was a nominal segment pre-2007. However, the transformation of the multinational corporate legal department after the 2007 recession forced inside counsel to seek out additional cost management tools, including outside financing of litigation – for litigation financiers, pursuit of enterprise level asset financing entails significant upside: core litigation continues to rise between companies across classes (e.g., class action shareholder, antitrust, commercial disputes, intellectual property), assets are generally uncorrelated with other asset classes, and if balanced with the appropriate resources and meritorious litigation, potential exists for large payouts. 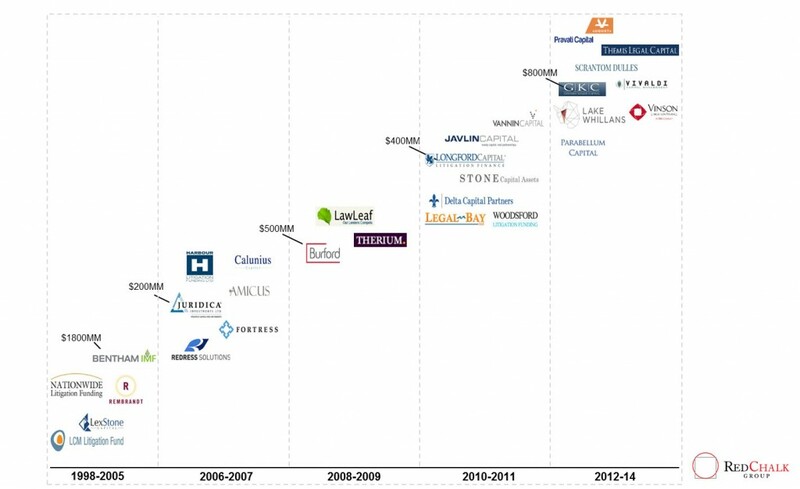 Since the early 2000s, the industry has grown rapidly, with players such as Bentham IMF rising to lead in AUM terms. See Exhibit 1. While initial reactions drew the ire of some in the legal profession as there were questions about the legality of these arrangements and concerns about conflicts of interest (e.g., champerty and maintenance), many of these concerns have been assuaged as several successful examples of litigation finance have been executed across the industry. Moreover, continued pressure on inside counsel has made general counsels amenable to litigation finance and also unlocked a new segment for the industry, law firms. As corporate legal departments began demanding lower rates and insourcing workstreams, law firms found themselves in need of capital to fund their expenses, and litigation finance firms were a natural fit. There is potential for significant growth through law firms and litigation finance partnerships. During the early stages of the litigation finance industry, most deals were smaller, “ad hoc” deals for specific situations. Now most enterprise litigation finance firms only finance large cases with the potential for significant payout – for example, the average investment of Gerchen Keller, a firm launched in 2013 with over $800MM in capital, increased almost three-fold from 2013 to 2015, from $3.7MM to $10.3MM. In addition, litigation finance firms have started moving away from ad hoc cases and are applying portfolio theory to diversify holdings and increase their risk-to-reward ratios. Instead of investing in single cases, many litigation finance firms have invested in a portfolio of cases, allowing them to hedge against potential losses and obtain a broad portfolio of uncorrelated cases. Additionally, some firms have partnered with law firms to finance operations for a percentage of earnings each year and others have looked to funding late-stage litigation, where the claim holder may be wary of appeals and want to cash out immediately. Bentham and Burford, another market leader, have invested heavily in mass torts, both in the U.S and in Europe. The success of these firms has attracted attention from traditional asset managers. Credit Suisse had one of the leading litigation finance teams but was forced to disband the group due to conflicts with its banking operations (since then, the leaders of the group have gone on to start their own firms). Meanwhile, other banks and hedge funds, such as J.P Morgan and Fortress Investments have shown interest in the burgeoning litigation finance field. At its heart, litigation finance displays the same tenets as most other investments – the firms have to understand the underlying claim asset at the center of the dispute, properly value these assets and determine the probability of various outcomes before pursuing an investment opportunity. With a finite set of cases that meet the requirements of these firms each year, the speed of diligence and accurate valuation of assets and opportunities presented will continue to heighten in importance and will be paramount to any one firm’s success in an evolving landscape.